Many folding users have reported that they encountered issue with GPGPU after installing nVidia 260.10 WHQL and 295.73 WHQL drivers on their machines. The issue symptoms are GPGPU client crashes after a few minutes/hours when the machine is folding alone whereas it works fine most of the time. The core starts to crash in a loop on an UNSTABLE_MACHINE error, which makes the client to go into sleep mode because of the high number of detected failures. After investigations, we have discovered that the problem is related to monitor sleep/standby mode. When it turns off, the WU that was running is completed fine, but all the following ones throw the error mentioned above. It looks like with these two versions of the drivers, the GPU is also deactivated when the monitor is in sleep mode. 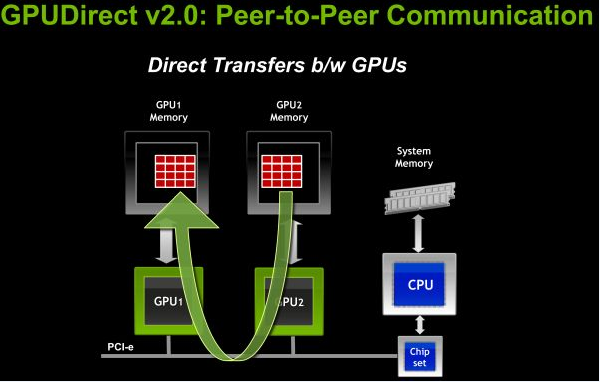 This removes the GPU from the available devices for CUDA or OpenCL applications. disable monitor standby in power control panel, and turn your monitor of manually using the power switch. The issue has been reported to the nVidia's forum, so we hope that the manufacturer will take it into account for the next driver releases. The latest beta drivers released today (301.24) seem to solve the GPGPU issue encountered with previous WHQL drivers. Up to now, it was possible to perform calculations using multiple GPUs, but due to the way CUDA is designed transfers of data between the cards would have to go via system memory, incurring a significant performance penalty that all-but negated the performance bonus from using multiple cards. It's not a revolution, but its a new feature which could be very useful! In addition to announcing the 6850 and 6870, AMD has released a new version of its drivers: Catalyst 10.10. This marks the first time AMD has promptly released drivers compatible with the latest generation of their graphics cards; previously, buyers would expect to wait for up to a month, if not longer, before they could enjoy full support for their equipment. Another important milestone for AMD and F@h is that this driver is the first to include the functionality required to run OpenCL applications. This version has the quaint subtitle of Accelerated Parallel Processing (APP) Technology Edition. The driver can be obtained from AMD's driver download page. A major driver update for nVidia graphics cards has just been released. Version 260.89, geared primarily towards Windows users, features a new and much simpler installer; the predecessor of which was beginning to seriously date, despite the pretty cosmetic improvements. This version of the driver supports all GeForce cards beyond the 6 series, including the new Fermi-based GT430, and carries over all the innovations introduced in previous versions. The driver can be obtained through the driver selection page over at nVidia's official website. Now that the first GPU3 units have arrived, we find ourselves needing to take our dusty old graphics drivers and replace them with shiny new ones. Up until now, versions of the ForceWare drivers have has Fermi support flagged as "experimental", but now a series of drivers has arrived to stabilise this support: Forceware 256. As always, the drivers are compatible with all cards from the GeForce 6 upwards. On the menu: support for Cuda v3.1, OpenCL v1.0, DX11, and OpenGL v4, as well as numerous other features such as the all-important 3D glasses support. These drivers are still very new, so no guarantees are made that they will work flawlessly with Folding@home, or that they won't crash your computer, identity thieve you, light your hair on fire, or set your default search engine to Bing. ATI has released the latest version of its graphics drivers for Radeon HD series cards (2xxx through to 5xxx). There isn't very much in the way of folding-related improvements; it's mainly gamers that are spoiled with benefits in this version. This version nonetheless contains the latest version of the API utilised in ATI GPU folding. Note that for once, this new ATI release is compatible with the 1.7x versions of the Linux X server, and therefore offers full support and 3D acceleration even under the Ubuntu 10.04 beta. It can be downloaded here. A persistent rumour has been spreading on the nVidia forums about the 196.75 drivers. Following reports from several users (specifically here, here and here), these drivers have a problem with the automatic fan speed control. The problem manifests itself in the fan failing to speed up when the card is under load (and therefore warmer). Some people have had cards burn themselves out due to overheating. nVidia has not officially confirmed the bug but the fact that the 196.75 drivers have been withdrawn from the download site seems a tacit admission of a serious problem with these drivers. If you have installed this set of drivers we urge you to remove them and replace them with the 196.21 WHQL or 196.34 beta drivers, which do not have this issue. Thanks to chhosni for reporting this information. Good news arrives for owners of laptops sporting nVidia graphics cards: a new official version of the laptop drivers has arrived! You can now install them as you would desktop drivers, without any fiddling about with registry or configuration file hacks. These drivers should have a long life expectancy in the case of us folders, as they provide support for CUDA 3.0 and OpenCL, in addition to support for hardware decoding of Flash 10.1 video. The drivers support the following chips: ION, GeForce 8M, 9M, 100M, 200M, Quadro NVS and FX. You can find them in the drivers download section of nVidia's website. As new graphics cards are released, so nVidia releases new drivers to support them. These Forceware 195.55 drivers are still in beta, but they function well on all cards from the GeForce 8 upwards. Improvements include support for the GeForce GT240, support for Flash 10.1 and performance improvements in games. OpenCL 1.0 and CUDA 3.0 support is also present. Note, however, that the beta requires you accept that use of these drivers will be at your own risk, and GPU client performance for Folding@Home is not guaranteed.